This event was organized by Tony and Janet Prichard and over 320 people attended the rally which took place place at Camping Alferweiher, a family run campsite about 1km. from the centre of Echternach in Luxembourg. The rally was centred on an area known as "Little Switzerland" because of its rock formations, forests and streams. Across the border in Germany is the Rhineland-Palatinate in the Eifel region. The region offered easy cycling along the river valleys with some hills off to the sides. A marquee was provided for shelter from the weather and where each morning fresh bread and croissants were available, still warm, and in the evenings the marquee became a social meeting place with Diekirch beer on tap with a selection of local wines. 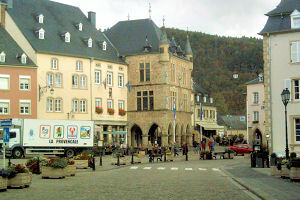 Echternach is the oldest town in Luxembourg, the European Destination of Excellence in 2008. It is situated in a bend of the Sûre river (Sauer in German). A few miles south the Sûre joins the Moselle (Mosel) and enters the wine producing region. Other sites in the city are the Roman Museum, the Parish Church of Saints Peter and Paul, the Ancient Cross of Justice in the market square, the medieval city wall with its seven bastions and the Museum of Pre-history. The pattern for each day, except Wednesday, was to offer a choice of three routes of about 50, 40 or 30 miles heading out or returning in the same direction. Each morning an hour of children's activities was organised. A team from the Mullerthal Tourist Office organised the Wednesday activities. Wednesday was a free day with people opting for a variety of activities. Some tried the climbing wall at the local youth hostel, some went canoeing on the Sûre while others visited Luxembourg City or tried an alternative version of one of the routes. 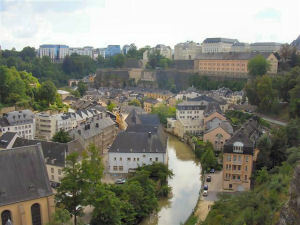 The places visited included the ancient Roman city of Trier, the pretty, small city of Vianden with its medieval chateau and festival, the historic town of Ettelbruck, the ancient town of Larochette, the Mullerthal Valley, the capital city Luxembourg passing Junglinster, the site of 208 Radio Luxembourg. Those of a certain age will remember The Ovaltinies, Michael Miles and Take your pick along with many other programmes which we listened to with its fading signal. For the small boys of any age we suggested a visit to RC Machines, a shop which has on display Harley Davidson Motorcycles and Tricycles, a Citroen Traction-Avant, a large scale model live steam railway locomotive, model trains running on elevated tracks, kits to build model steam engines and all the machine tools to make any model you care to think of. On Sunday we started with a gentle introduction to the area with the medium ride going to Vianden and the long ride going on to Ettelbruck, Diekirch and Larochette. The short route turned at Reisdorf to return down the German side of the Sûre. 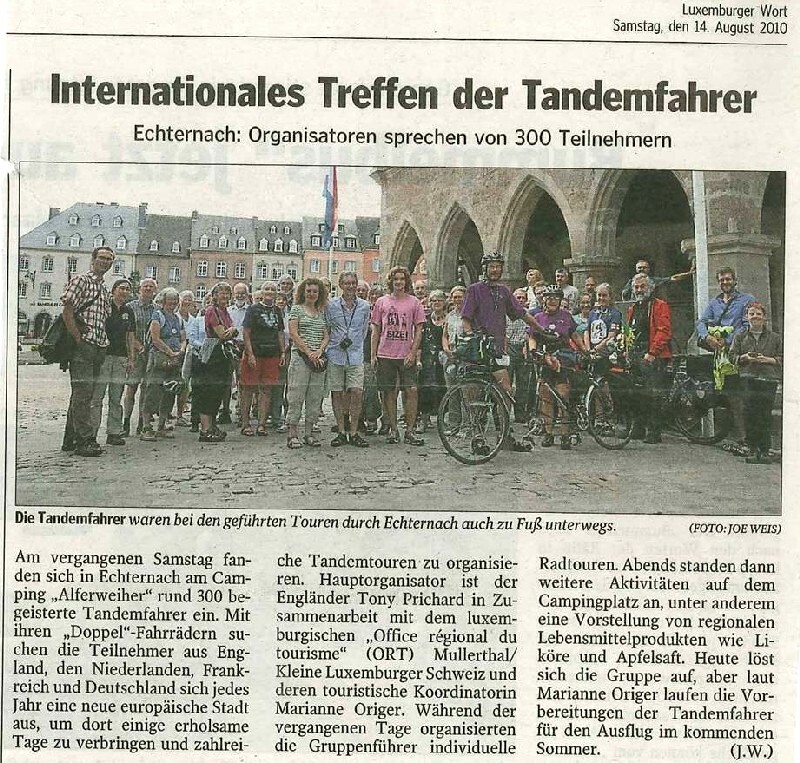 Many tandem crews stopped at Bollendorf to sample the excellent ice cream. Monday took us up the Mullerthal valley via Berdorf and round to the 17th. century castle at Beaufort with its' torture chamber, water tower and spiral staircase. In the evening Luc and Isabelle, the proprietors of Kulturhaff Millermoler, and Georges Shiltz brought us some local produce including breads, cheeses, wines and Kir to sample and buy. We were to meet the KM people later in the week. 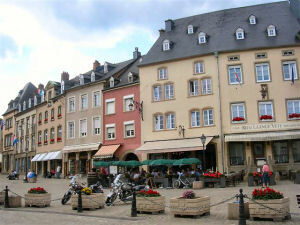 Tuesday's long ride destination was Luxembourg City although many people opted to shorten the distance by starting from Junglinster while the short and medium rides explored the countryside to the North of the main Echternach - Luxembourg road. In the evening the traditional Cycle Jumble Sale was held. There were no scheduled rides for Wednesday so people took the opportunity to explore the area or just relax. Thursday was a challenging day with lots of hills following the route up through the villages to Bitburg. The return route found its way back along the dedicated cycle routes of the Prumtal radweg or Nimstal radweg. Some 60 members opted for the evening guided tour of Echternach. To finish the rally we opted for a flat 50mile ride alongside the Sûre, crossing the Moselle by the ferry between Wasserbillig and Oberbillig, and then alongside the Moselle up to Germany's oldest City, Trier. Most people managed to visit this city and view some of the attractions including the Porta Nigra and the Roman Bridge. The return was back down the German side of the two rivers. The highlight of the final evening was the music provided by the Gehaansbleiser Diddeleng brass band while we enjoyed a barbecue/picnic.